Running coaches are near-mythical creatures. They’re expected, whether by experience, intuition, or some degree of black magic, to conjure up prized PRs for their athletes. Often as well-grounded in human psychology as physiology, they’re required not only to know the right thing to do, but also how to get a person to do it. If anyone can pull a few extra minutes or miles out of a runner, it’s probably Leah Soro Skinner. 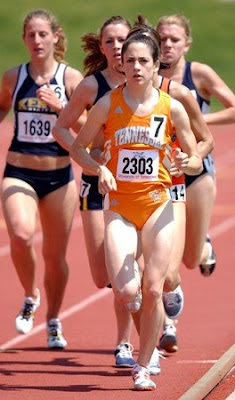 A former Division 1 cross country and track athlete at the University of Tennessee, she has the background and the experience. But more than that, she has the personality. If you talk to her about running even for a few minutes, you come away with the impression that she’s someone you can trust, someone who knows a lot about and cares deeply for the subject matter. Leah started her coaching business, Enlightened Performance, in February. Currently all of her clients are marathoners, though she doesn’t specifically focus on that distance. Some are beginners, while others have targeted goals like qualifying for the Boston Marathon. She also works with high school students at St. Michael's Catholic Academy as assistant coach to Jeff Cunningham, esteemed head coach of Rogue High School Training. Separating training into four phases, Leah has her athletes do as much of their preferred type of workout as possible in the hardest phase so they don’t get burned out. She also adapts workouts to the runner’s personal life, taking into account work, stress, kids, sleep, time, and other events and obligations that affect performance. The training plan is never set in stone. Leah’s husband, Gray Skinner, is a cat 1 cyclist. A full-time lawyer, he coaches a small number of cyclists on the side. Leah is a cyclist as well, racing as a cat 3 for Snapple-ATC Racing. The Skinners are considering combining their expertise in the two disciplines in a multisport program. This program wouldn't be specifically designed for dedicated triathletes, but rather those athletes who fall somewhere in between – an individual who wants to compete in both running and triathlon, for example, or someone who’s simply interested in incorporating running and cycling in a general fitness program. So what is it about coaches – those magical leprechauns and sometimes evil taskmasters – that makes them so successful at leading athletes to that long-sought pot of gold at the finish line? Kirk Larson, a client whose goal is to run a sub 3 hour marathon, has had big improvements this year. When she talks about his accomplishments, Leah sounds as proud as if she were speaking of her own. “I’ll kind of rag on him,” she says. “He had no idea what he was doing. He was just following a training plan, and he ran a 3:33 for his first marathon. He really wanted to run the Austin Marathon before Vancouver, so I had him run really slow and then tempo the last 10k. He ran a 3:18 and felt like it was easy. That was a huge confidence booster for him. He’s been doing incredible stuff, like the other day he PRed in the 5k in the middle of a workout. He just needed a little bit more structure and to understand his body.” A few weeks ago, Kirk set another PR at the BMO Vancouver Marathon, running a 3:06. Sign up to win carbon wheels! World Champ Chrissie Wellington stops by Austin Tri-Cyclist for a ride! Come check out our collection of Shimano, Louis Garneau, Mavic, and NOW GIRO triathlon shoes! Join us for our Annual Memorial Weekend SALE! -Meet Kestrel Pro Cam Dye at Austin Tri-Cyclist on Sunday from 1:30-2:30/ If you are doing Captex, or in Austin, stop by and ask him how he goes so fast on his Kestrel 4000 and what he learned recently in the wind tunnel! Come in wearing a blonde curly wig and get a free ATC T-Shirt! Infamous for being one of the hardest and hilliest stage races in the U.S., Tour of the Gila is a one-way ticket to humility for riders getting too big for their cycling britches. Held in Silver City, New Mexico, at roughly 6,000 feet in elevation, the event is five days for most categories and includes three road races, a criterium, and a time trial. This year there were 493 registrants, plus 141 competitors in the men’s UCI race. The women’s Pro 1,2 field boasted many of the best teams and riders in the nation – Kristin Armstrong, Carmen Small, Alison Powers, Jade Wilcoxson, and Robin Farina, just to name a few. Obviously, I didn’t know what I was doing when I signed myself up. I didn’t even know how to pronounce Gila (it’s HEE-la), much less the challenges of the altitude or the fact that my competition included Olympic and World Championship medalists. And what’s worse, having never done a National Calendar Race before, I was still under the assumption that I was “fast.” In a field of superhuman women as strong, aggressive, and savvy as the best men I’d ever ridden with, I found myself to be a lesser type of pack fodder – there for what, frankly speaking, was probably the most painful week of my entire life. Even in a neutral start, the women pros roll out fast. 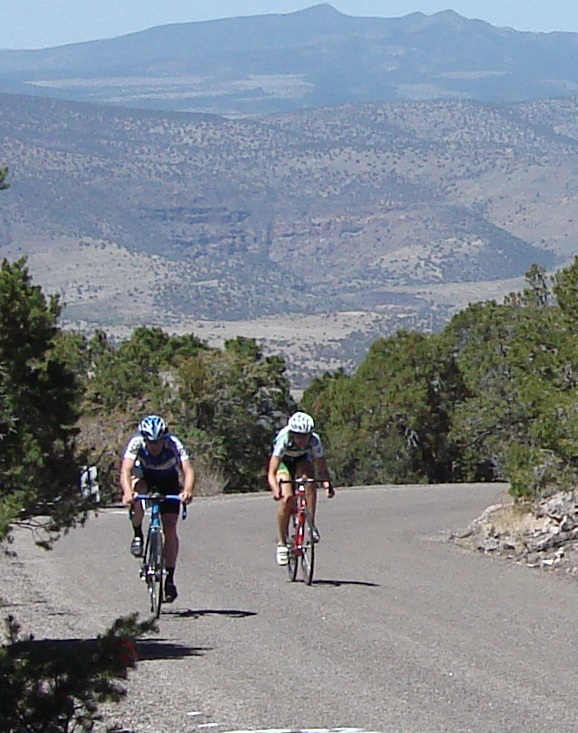 The Mogollon Road Race was 73.1 miles, finishing at 6,794 feet after 3,669 feet of climbing, most of it in the last 6.7-mile stretch. Since the first 27 miles or so of the race were net downhill and the steep climb to Mogollon was guaranteed to split up the field, I figured there wasn’t going to be much happening at the beginning of the race. Surprised, I watched attack after attack go off the front almost immediately. In addition to stage wins and overall GC standings, there was a sprinter’s jersey, “queen of the mountain” jersey, and young rider (U26) jersey up for grabs. The first day there were two bonus sprints, which probably helped to spur things along, and the final climb was a QOM. This was also, as I heard many, many times throughout the week, an “Olympic year.” The riders were in top shape. Although the pace was comfortable where I was riding at the back of the pack, we weren’t spending any time looking at the scenery. Like the UCI men, the women’s Pro 1,2 road races had support vehicles, dedicated mechanics, and a police entourage in front and behind shutting down the whole road in a “rolling enclosure.” The honking of the moto officials, and later the team cars, zooming by on the left took some getting used to, but the hardest part was overcoming the sense that I was an obvious imposter in some type of royal procession. I had come to Gila as a guest rider for Landis/Trek, a team sponsored by 100-year-old, Phoenix-based shop Landis Cyclery. I’d met my teammates the night before – Julie Emmerman, Caitlin Laroche, Natalie Koch, and women’s team captain Melanie Colavito. Most of the other teams were made up of dedicated pros and had eight riders. As a small amateur team, we had neither the ability nor the responsibility to be a major player in race tactics, which gave even the guest riders – Julie and me – and the riders who were racing NRC for the first time – Caitlin and me – the luxury of sitting in and more or less riding for ourselves. We were here to represent Landis/Trek to the best of our abilities, contributing to the team when possible, but there was no demand for sacrifice or established hierarchy of work. Anxious to prove myself to my new teammates, I was determined to ride smart and ride well. I had never, with the exception of one flat tire in a time trial when I was still competing in the “triathlete” category, had a mechanical during a race. And though I of course realized that someday, somewhere I would, I didn’t count on it being on the first day of my first NRC stage race. Still nervously watching what was going on – at one point narrowly avoiding a rider who went down in the middle of the pack – somewhere around mile 25 I realized that my rear shifter was stuck, and I couldn’t shift out of the hardest gear. Dumbstruck, I tried again and again to shift. A debilitating mechanical within the first hour of the race...yes, now my team would be thoroughly impressed with me. Melanie told me to go to the Comm car. Before I’d been nervous at the prospect of even going back for water bottles, but now I had no choice. I drifted back to the first motorcycle, then to the neutral support SRAM car. The SRAM guys told me to pull over, and I did, fighting back very un-pro tears of frustration as the pack rode away and the team cars swerved around me and then the whole caravan disappeared around the next corner. The two mechanics fiddled with my bike for no more than a second – the shifter cable had snapped – before they took a neutral bike off the rack and adjusted the seat and gave me a running push. The mechanic had asked me if I was familiar with the SRAM gruppo, and thinking “how hard can it be?”, I had just said “yes” for the sake of time, ignorant of the fact that anything could work differently than Shimano in the first place. I remedied my mistake as I cranked up the first hill in my big ring, waving my hands and riding up alongside the passenger window to sheepishly request further instruction. I knew I was supposed to draft the car to get back up to the pack, but I wasn’t really sure how to do it or how long I could do it. When we reached the first turn back onto the main road, two riders were passing through the intersection from my left. I was already in full-out, panicked time trial mode, so I wondered how they could have come from that direction, but when I caught up to them and they were going slow I just went around. About a minute later the SRAM driver leaned out of the window and told me I didn’t need to go so hard. It turned out that I had just passed the leaders of the race; a breakaway had taken the wrong turn. The rest of the pack was neutralized until the leaders came by and reestablished their gap, so I had plenty of time to catch back on. I’m not sure which was more impressive – my bad luck or my good luck – but having the whole race stop dead in its tracks just when I needed it to was enough to make me believe that the universe was benevolent, or had at least found my struggle amusing enough to help me continue on to the next stage. The baked sweet potato was an experiment, something I’d seen an FCS/Rouse rider with at the Come and Take It Omnium. I have to admit that it’s not the prettiest thing to eat – neither the brown-orange coloring nor the way you have to shove it down Cookie-Monster style while on the bike – but it is a great conversation starter. When we began moving again I didn’t care about the break up the road and had no clue how many riders were in it or if it was expected to last; I just wanted to arrive as fresh as possible at the base of the climb and know how to shift when I got there. On the new bike, the reach was much too long for me and I could feel something funny happening in my calves, but it was very light and the SRAM gruppo and I were finally getting along. Just as my more experienced teammates had predicted, the race split at the start of the climb. I didn’t make the first selection and was out on my own with a handful of other riders, a less-than-ideal situation for the flat plateau that followed. The group ahead of us crashed near the end of the flat section, a scene of complete chaos with four or five riders sprawled across the pavement and the team cars pulling off on both sides of the road and our group trying to wind our way through it all. A short while later, several of the riders involved in the crash repassed me at lightning speed, regaining a lot of ground. This stage would be my best finish of the week, 20th place overall. Most people seem to think that Gila’s last stage is the hardest, but for me it was the second day’s 77.9-mile Inner Loop Road Race. I didn’t warm up, and my legs were aching the first few miles; I was convinced for roughly half the race that I had a flat tire. I still had very ambitious goals – the day before, I’d believed that trying to catch up to the pack and being on a different bike had burned up a lot of energy, that otherwise I would have been much stronger – but I soon found out that my fitness was the weak link here, not my equipment. When we took a right turn toward Pinos Altos, the pace picked up on a steady, seemingly never-ending uphill slope. I came off the back at about mile 12, one of the first to go and reeling with disbelief. Popped in the very first section? Really? I sat behind two other riders who were working to catch back on. 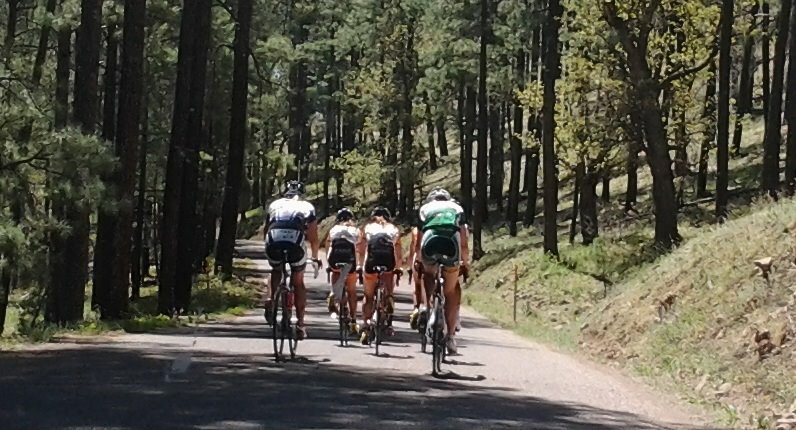 We were passed by the team cars as we started the first big descent into a forested area that I would have thought beautiful under other circumstances. There are many ways I was not prepared for Gila. I rarely ride more than 50 miles (I’ve rode more than 75 miles maybe three times, and even then never at race pace and never consecutively). My local races are typically much shorter, with an average field size of 25 compared to Gila’s 60 riders, and I’ve yet to master the art of getting where I want to be in a large pack. But perhaps most importantly, my native training ground is gloriously flat. These “hills” were a new kind of beast, where the draft doesn’t save you and the narrow, snaking descents can kill you, with top speeds hitting more than 50mph. Desperately trying to catch back on to the peloton – I could see them up the road now; a major split had occurred and the lead group of 20 or so riders had pulled away – I was taking the turns of the descent as fast as I dared. A rider stopped for a flat tire just ahead of me and there was another chaotic reshuffling of team cars like the day before – I had to slam on my brakes and come to a complete stop, then get back to it again. I caught up to the peloton a few minutes later. This time I told myself I was going to spit up blood before I let them drop me again, so I just put my head down and suffered through each hill, praying for the next downhill to come soon. The descents, however, weren’t always a good time to rest because I was dodging other riders, my hands clamped firmly on the brakes, readying myself for whatever happened up the road and what I couldn’t see beyond the next turn. This was especially true of the last descent. 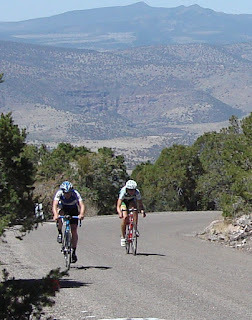 To quote the Gila Race Bible: “At 28.7 miles, Wild Horse Mesa is the start of a very technical 1,000+ foot drop. This 3 mile descent has numerous sharp corners, hairpins and two switchbacks.” Understatement. My teammate Melanie had made the first selection, and Julie and Caitlin were comfortable in the second pack with me, Julie often pulling at the front, but I genuinely thought I might die before the end. My legs – or rather, my whole body – felt horrible. From roughly mile 30 to mile 60, the route is relatively flat. All of the big teams had someone in the break; in this flat section, the pace finally slowed enough that I started thinking about water and nothing else. I’d skipped all of the previous feed zones, since I had full bottles then and was barely clinging to the back, but now I was completely out and our team car was up the road with Melanie. When I looked down at the cue sheet taped to my toptube for the mile marker of the next feed zone, I discovered that it was more than 20 miles away. There were a few climbs in the last 10 miles where I was sure someone was going to attack and I was going to be dropped again, but I think the pack had lost its incentive to push the pace. We’d been told at one point that the lead pack had 15 minutes on us. Our group of about 35 riders was all together coming into the finishing straight, stretched out across the whole road and three or four deep, and I was stuck right at the center of it with no way to get out. I was certain that was it, after 79 miles of hell I was going to crash 100 meters from the finish line. I kept waiting for them to start the sprint, but no one did, until finally we were crossing the line at the same steady pace and someone to my right was saying, “Ah, these girls are smart!” The peloton had decided to come in together, which would give us all the same pack finish time and prevent the riders who lost out in the sprint from not meeting the time cut. Now I was extremely grateful that my mistake in positioning had prevented me from making a much bigger one. The first rider had crossed the line about 18 minutes ahead of us. I went back to our cabin in Silver City and immediately fell into bed, with “this is only the second day, only the second day, only the second day...” stuck in my head like the chorus of a song. The 16-mile time trial was what I’d been looking forward to initially. No tactics, no real racing experience required, just going hard. But I was a little nervous about my brand new, UCI-legal setup. 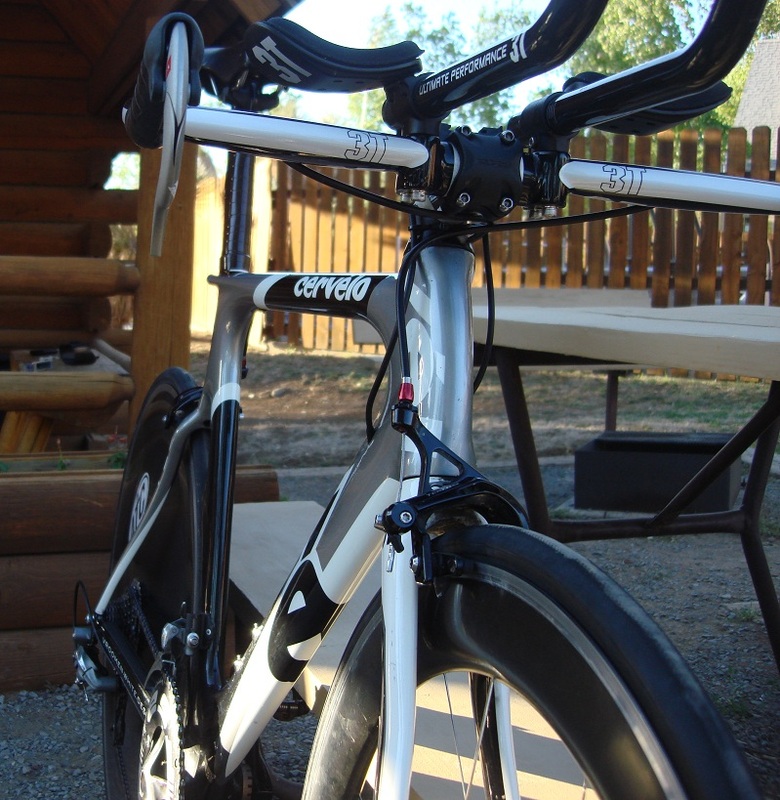 I’d only had a chance to ride my TT bike one or two times since we’d replaced my very comfortable and time-tested, but UCI-illegal,Vision aero bars with the 3T Aura. We’d also moved my saddle backward a few centimeters. Jack had been researching the UCI’s strange and obscure rule system for some time, but we quickly found out that what each UCI race enforces differs widely. The Vision aero bars that we had spent so much money on to replace passed for other riders, as did the Cervelo P2 seatpost – the seatpost, however, was less of an annoyance since we’d merely attached a styrofoam cup to it with electrical tape, which could easily be removed. But there were other problems to contend with. First, the officials declared that my seat was tilted too much – they said it had to come up 3 degrees, or in other words, be flat, regardless of the fact that the Adamo seat is designed with a slight rise in the back. We had to point the nose of the seat up, which meant I had to also adjust the seat height; the result was still very uncomfortable. Many other pro riders were being cited for this “problem” as well. Second, the officials said my extensions were pointed up too much. The only way to fix this was to point my base bar down, turning what had been an airfoil shape into a carbon fiber parachute. Then, after we made these changes and went back through the line again, they said that the seat was now too far forward (a result of lowering the seatpost) and it had to be moved back another centimeter. I went through the line three times, which took the better part of an hour because the pro men were coming through for their start at the same time and had priority. I’m always extremely nervous before a TT anyway, but by the last go with the officials my cortisol levels were through the roof. I was also convinced that when I went through the final time on my way to staging they were going to find something new and they’d have to take me off screaming to the nuthouse in my cleats and pointy aero helmet. For what it’s worth, the officials were apologetic and didn’t seem to like enforcing the UCI rules any better than we liked swallowing them. Thankfully, they didn’t say anything about my setup before the start, although we went through the whole tape-measuring rigmarole a fourth time. Then, by some miracle, I was finally allowed to do what I had come here for – race. Gila’s TT course was, again, nothing like what I’d experienced before. Unlike Austin’s rollers, these hills took planning. I had to measure out my power carefully. After Hammerfest’s TT, I had learned that I needed to stick to a lower number in the first, flat section no matter how slow it felt. The way out was a long, gradual uphill for about four miles, followed by a steeper incline and then a long, very fast downhill. Even though I’d told myself I was going to follow my power goals, I was still going a little too hard on the way out. My legs felt alive again, nothing like the day before, and I seemed to be gaining on at least one of the girls ahead of me. Then somewhere near the turnaround point I got passed like I was on a weekend joyride by a woman in an Exergy Twenty12 kit (and no, it wasn’t Kristin Armstrong). Think the tortoise and the hare, except it was probably more like the tortoise and the McLaren F1. It’s hard to describe what went on in my head in that instant. “How...who...am I going that slow? Wait!” I don’t think I’ve ever been passed by another woman in a TT when I was on my full TT setup, or certainly never so definitively. I tried to just stick to my own, predesignated pace, but my legs took on a life of their own. She’ll beat my time, I was thinking, but I could at least try to minimize the damage by keeping the distance about the same. It would push me, and that would be a good thing. Going back up the big hill around mile 11 – this was the finale, really, as it was virtually all coasting in to the finish on a gradual downhill after that – she made it look deceptively easy and steady. I was up and down out of the saddle, my lungs ready to burst, and when I did look down at my head unit I was still at a much lower power than what I’d planned for. After I crested the hill, I don’t think I saw her again. I wasn’t quite spinning out on the downhill but I was very close. After a few gasping breaths at the beginning I felt like I had a little more juice but couldn't do anything with it. I counted to a hundred over and over again, my feet spinning as fast as I could make them go. The rider ahead of me that I thought I would pass stayed the same maddening distance away, and I could do nothing to increase my speed. There was just one very short flat at the line, a few moments to pick up the pace again before it was over. Kristin Armstrong finished in 37:13. That’s a 787 jet to my yet more pitiful-seeming tortoise, waddling in a full 5:39 behind. I placed 24th overall. I think the worst part of racing with a completely new group of people in a completely new setting is you don’t know what to expect. The crit had my stomach in knots long before we started, my one consolation that it would be roughly 27 miles, 25 laps in total. I told myself that I was capable of hanging onto anything for an hour. I’d heard the pack typically stayed together in this stage, so as long as I managed to not get dropped I wouldn’t lose much time in GC. 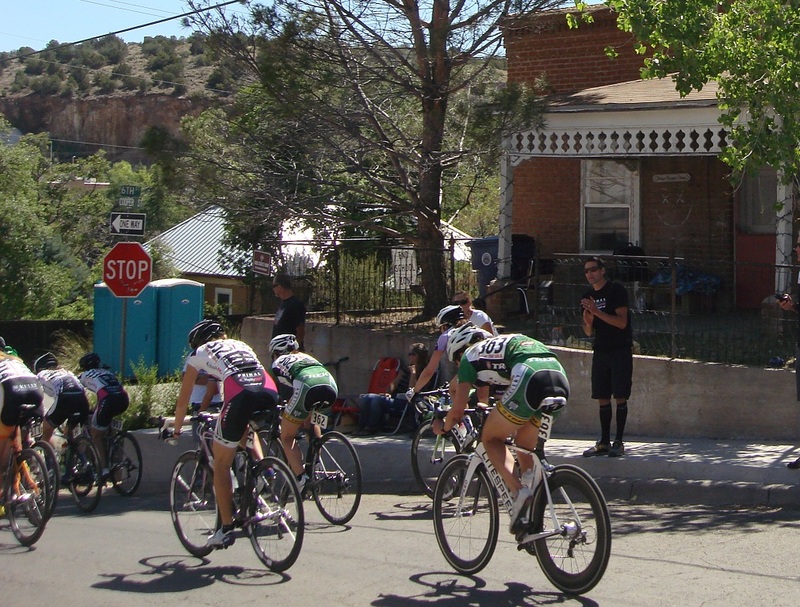 Gila’s crit course is unusually hilly. Situated in the middle of town and ringed by a nice-sized crowd, it was roughly square, with one windy, flat straightaway on one side and a steep hill on the opposite side with an equally steep downhill. At 18, 12, and 6 laps to go there were time bonuses, sprinter points, and primes. 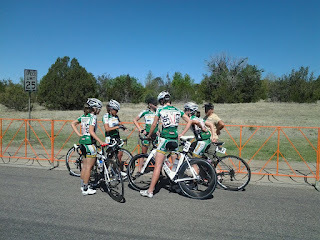 Before the race started they called up the top 15 in GC and listed out their national and international accomplishments. (As if I needed any more intimidation, but it at least made me feel better about getting dropped on the second day.) When the race started, I was saying silent thank yous to the Driveway Series for preparing me for this moment – Patrick Darragh in particular, those first few crits of the season. We launched into a sprint from the gun and from there it was top speed around the next two corners and up the big hill. The pace didn’t slow as we continued onto the next lap and the next, and I knew if it were the Driveway 3/4 men’s race half the field would have been dropped or begging for mercy. This was going to be an extremely fast hour. I haven’t crashed since last year, and I’ve only crashed once, but since I obviously couldn’t go a single stage without visiting my SRAM support friends, it happened on the third lap. Just around the corner as we started up the hill the pack suddenly slowed and there was a massive, synchronized wobble in front of us – “uh oh,” I thought, “someone is going to go down ahead of me” – and then I noticed that my front wheel was locked to the back wheel of the rider to my right. I can’t really tell you what happened then, except that I was perfectly calm and still thinking I could wiggle my way free, and then it felt like a sumo wrestler picked me up and slammed me on the ground. As I got up and tried to get back on my bike, I made some very undignified sorry-for-myself noises; I was surprised and embarrassed and the left side of my body was stinging at all the bony points where skin had scraped pavement. And my bike didn’t seem to be going anywhere – the chain was stuck. 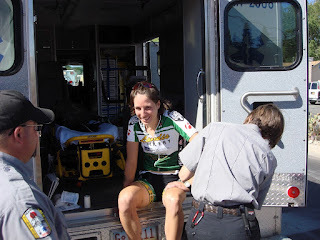 I looked back at the other rider who had crashed, but she was walking her bike, seeming unscathed and extremely annoyed. I couldn’t tell where she was going, and she certainly didn’t seem to be in any hurry. I started running my bike up the hill as if I was in triathlon transition, asking anyone and everyone on the sidelines where I should go. I knew there were two wheel pits – one near the start/finish and the other somewhere up ahead, but I couldn’t see either, and I didn’t know which was technically closer or how best to go about getting there. Jack came sprinting down the hill when he saw me, thinking I’d had another freak mechanical, but he was afraid to touch the bike because he wasn’t sure if I’d be disqualified. Finally I saw the wheel pit, and the other rider who had crashed rode slowly by me to my right. Just before I got to the mechanics, someone said dryly – “You know you don’t have to run.” Good advice, but too late. With a crash, or in most cases even if you get caught behind a crash, you get a free lap. After they fixed the chain, the mechanics held my bike and gave me a push just as the pack came by. With the adrenaline rush, it wasn’t as hard as I thought it would be to catch on to the back and get started again, but then the race seemed to go on forever. Sprinting out of the corner onto the long straightaway, the slow-by-comparison back half, the sprint up the hill, resting on the fast downhill and the long slope after the turn, then repeating the process again and again and again... A crit isn’t terribly exciting when all your courage is gone and you’re bobbing off the back for the duration. Julie stayed up near the front for most of the race, in a great position. Melanie was back near me, although always seemingly more in control of the situation. I saw her surge suddenly and move up on the last lap but didn’t understand why until half a dozen riders were riding slowly in the middle of the road ahead of me, their jobs done and content to cruise in to the finish. I dodged them and kept my place at the back of the riders still vying for position, happy to have finished with the pack at all. 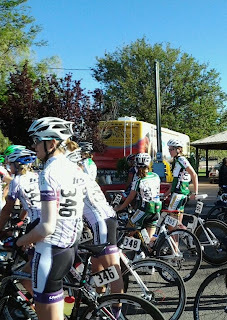 The final day’s Gila Monster Road Race started at Gough Park, the same venue as stage 1, and then traced most of stage 2’s course backward, so it seemed like the week really had come full circle. I felt surprisingly good, as if my body had finally adjusted to the daily beating. And I knew where we were going and what the roads and hills would look like, even if I was dreading the final climb. The race started out on some rollers, the pace fast but not too fast, and an early break got away with most of the teams represented and stayed away for a long time. 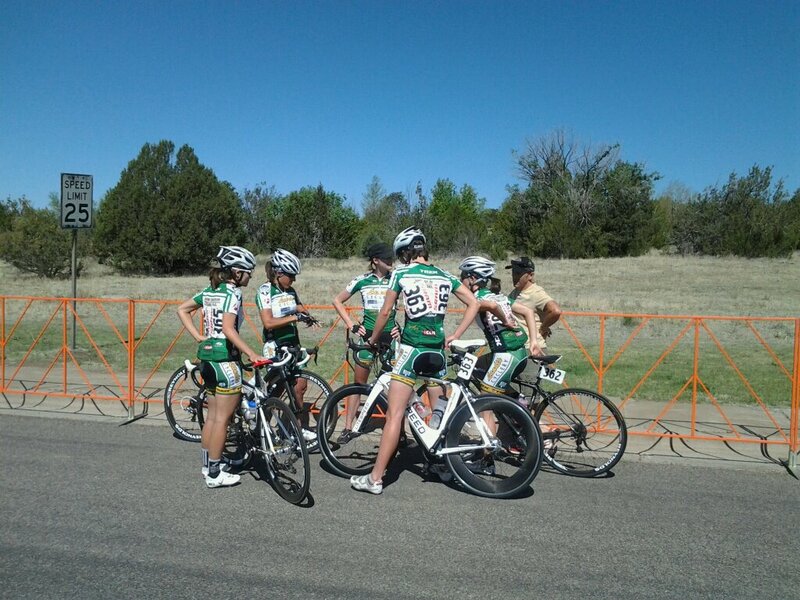 Colavita was the only large team not in the break, and they put in a coordinated and sustained effort to get it back. In the end we were successful in catching the leaders, but another group got away soon after, and when they had about a minute on the field and had reached the start of the final climb, Kristin Armstrong bridged up to them and, shortly after, attacked the break... Jack, who was driving our team car for the final stage, heard this on his radio, but I was fairly oblivious to it all. Once again, I was conserving my energy for the climb, and after five days of racing with this field I had much more modest expectations for myself. The climb started at around 53 miles, going up the same steep, technical descent we’d come down on Thursday. The pack immediately split apart, every rider hammering up the road in her own bubble of pain. The road did level out in sections, however, and having fallen off of the small group of riders ahead of me, it was very difficult to get them back. I could see Melanie riding with them, extra incentive to keep trying. I caught them just after a descent, and then decided my goal would be to stay with the group, help Melanie when I could, and maybe try to get ahead of the other teams in the sprint at the end. For a time I thought I hadn’t gone hard enough and I could be doing more, but on the final, short rise to the line I felt a deep ache consuming my legs like a slow-burning fire, and I wondered if I was going to fall over before the end of the sprint, and if I did, if I could just walk to the line. But I made it on two wheels, relieved at last to have finished Gila and, best of all, to not have another race to wake up to the next morning. I’ve been asked whether Tour of the Gila was “fun.” Even looking back from a comfortable distance, I have to say that no, it wasn’t; I’d probably go with “character building.” But those five days were invaluable to me. I have a little over a year of racing experience, maybe three years in total of bike training, and I had the opportunity and the privilege to race alongside the most talented and famous women cyclists in the world. Even if I had to abandon my dignity for a while and come to terms with the fact that I couldn’t always keep up with them, Gila was an experience I wouldn’t trade for anything. To Landis/Trek, for letting me be a part of the team for a week; to the awesome EMS team that got Silver City’s gravel out of my elbow post-race; and to the owners and staff at the Silver City KOA, whose cabins and facilities were excellent and whose enthusiasm and friendliness were truly one of a kind. Kudos to Silver City and the organizers and sponsors of Tour of the Gila for putting on a world-class race! 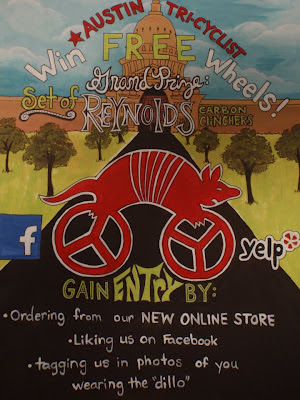 To celebrate Bike Month, Austin Tri-Cyclist is bringing you the biggest dillo promotion in the history of ATC! You can win an array of prizes. 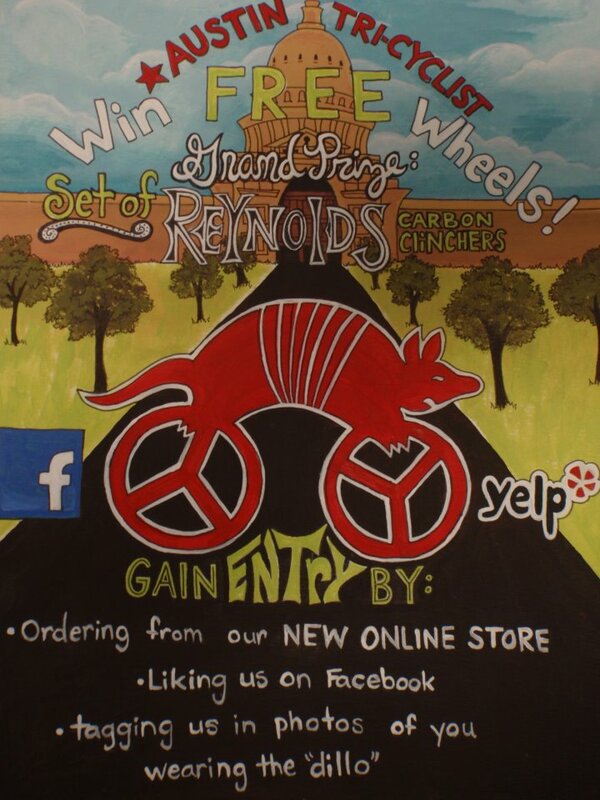 The Grand Prize is a Reynolds Carbon Clincher R2 (retailed at $1000) set. Keep up with all of the Bike Month events at BikeMonthMap!